ERFURT, Germany -- Alexander Povetkin of Russia defeated Ruslan Chagaev by unanimous decision Saturday to claim the vacant WBA heavyweight title. The title was Wladimir Klitschko's following the Ukrainian's victory over David Haye by unanimous decision in Hamburg last month, but was declared vacant when the WBA elevated Klitschko to "super champion" status. Povetkin, the 2004 Olympic heavyweight champion, remains undefeated after 22 fights (15 KOs), and becomes the mandatory challenger for Klitschko. "I don't want to think about Klitschko," said Teddy Atlas, Povetkin's American trainer. "I want to think about Povetkin and this title ... we'll think about Klitschko some other time." Povetkin won on the judges' cards 116-112, 117-113, 117-113. ERFURT, Germany (AP) — Alexander Povetkin of Russia defeated Ruslan Chagaev by unanimous decision Saturday to claim the vacant WBA heavyweight title. Chagaev, of Uzbekistan, held the WBA title from 2007-09. His record fell to 27-2 (17 KOs), with one draw. "I'm sorry, today was not my day. But that's boxing, that's sport," Chagaev said. "He's a good boxer, a real world champion now." Chagaev, 32, recovered from a poor start to rattle Povetkin in the sixth round, catching him cleanly with left and right hooks to leave the 31-year-old unsteady on his feet. Atlas called on Povetkin to fight for the honor of his father, who died last year, and the Russian regained the upper hand in the ninth as Chagaev appeared to tire. "My father always hoped and wanted for me to be a world champion," Povetkin said. "It was a very hard fight. It was very hard to fight him. I have a lot of respect for him. He's a very difficult and patient boxer." Alexander Povetkin (22-0, 15 KOs) overcame a mid-fight surge from former world titlist Ruslan Chagaev (27-2-1, 17 KOs) to take a solid 12-round decision by scores of 116-112, 117-113, and 117-113. Povetkin also captured the recently created and vacant WBA “regular” world heavyweight title. Povetkin jumped to an early lead, taking the first five rounds on The Boxing Tribune scorecard before the southpaw, Chagaev let his hands go, landing several big left hands and taking rounds six through eight. From the ninth round on, Povetkin regained the control he enjoyed in the first five rounds, letting his hands go and finishing ahead on all three judges’ scorecards. The Boxing Tribune scored the fight 117-111 for Povetkin. On the undercard, Robert Helenius (16-0, 11 KOs) stopped former WBO heavyweight titlist, Siarhei Liakhovich (25-4, 16 KOs) in the ninth round of their scheduled 12. A relatively even fight through seven, Helenius’ heavy-handed shots slowly began taking their toll on Liakhovich, who was sent to the canvas at the end of the eighth round with several hard shots. The former titlist came out throwing in the ninth, but was stopped in his tracks by a monstrous Helenius uppercut. Out on his feet, Liakhovich absorbed several more thudding blows before the referee stepped in to wave off the bout. In a heavyweight boxing card featuring some of the bigger names in the division other than “Klitschko,” Alexander Povetkin came on strong in the second half of the fight to win a unanimous decision over former WBA heavyweight champion Ruslan “White Tyson” Chagaev, while rising star Robert “The Nordic Nightmare” Helenius came from behind to stop former WBO heavyweight champ Sergei “The White Wolf” Liakhovich tonight at the Messehalle in Erfurt, Germany. The southpaw Chagaev looked strong in the first half of the fight with Povetkin, and rattled the Russian in the third round with some hard left hands. However, from round seven onwards, Povetkin slowly began to take over, repeatedly nailing Chagaev with uppercuts and combinations. ERFURT, Germany -- Staten Island boxing trainer Teddy Atlas got on a plane bound for Moscow about three weeks ago saying he needed about seven weeks to prepare Russia's Alexander Povetkin for Saturday night's WBA heavyweight title fight against Ruslan Chagaev. "Eight weeks," the Todt Hill resident said of the prep time necessary for a responsible professional fighter. "Seven, if there's no other way." As it turned out, three weeks was all Atlas needed to turn Povetkin into a world champ. 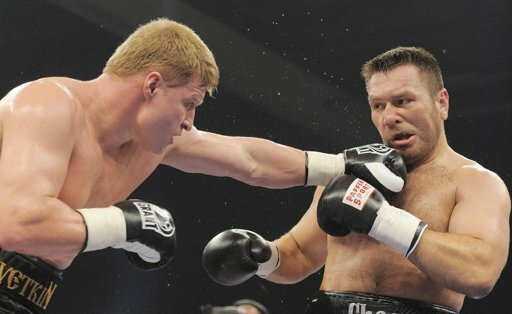 Povetkin, the 2004 Olympic heavyweight champion, defeated Chagaev by unanimous decision. Povetkin remains undefeated after 22 fights (15 KOs), and becomes the mandatory challenger for Klitschko. "I don't want to think about Klitschko," said Atlas, Povetkin's American trainer. "I want to think about Povetkin and this title ... we'll think about Klitschko some other time." solid action-filled fight for the vacant WBA "regular" heavyweight title. little too wide, at least in the eyes of this reporter, who had Povetkin but only by 115-113.
made to miss with his left. fought here would certainly lose to the Povetkin who beat Eddie Chambers a few years back. a left uppercut and Helenius followed and it was stopped with Liakhovich going down a second time. After eight the judges had it 77-74 and 76-75 for Helenius and 76-75 Liakhovich.